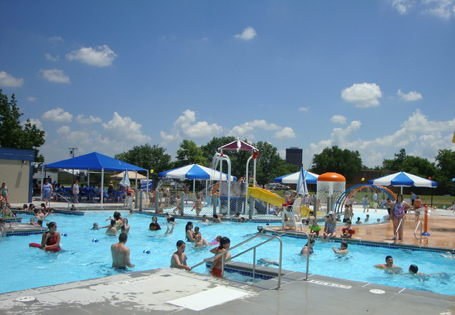 In March 2008, the City of Bartlesville, Oklahoma, commissioned Counsilman-Hunsaker to conduct swimming pool audits for two outdoor swimming pools: Frontier Pool (built in 1970) and Sooner Pool (built in 1979). Recommendations and cost estimates to repair/replace the physically and functionally obsolete pools were provided. In July 2008, Counsilman-Hunsaker completed a Feasibility Study to educate the city representatives on new aquatic trends and features. From the information retained from this report, the city representatives voted to replace Frontier Pool with a new aquatic center and close the Sooner Pool and add a sprayground adjacent to the pool. Following design, Counsilman-Hunsaker provided construction administration as well as opening day support by being present to assist staff with two soft openings and the Grand Opening. The Counsilman-Hunsaker support included working side-by-side with the pool staff to discuss operational protocols, water chemistry guidelines, pool water balance, and chemical controller operations. A Standard Operating Procedure Manual was supplied for the city which included city procedures, policies, forms, job descriptions, rules, rates, and guidelines required for running an aquatic facility.